So that you guys know exactly what kinds of sheds are out there for you, here at WhatShed we have decided to put all the leading brands through their paces. Today it is the turn of Palram to be reviewed. In our Palram review we will be looking at the different types of products that they sell, how well made they are and of course if we feel that they are good value for money. By the end of this review, you will have a much better idea if Palram are the brand that you should be spending your hard earned money on. 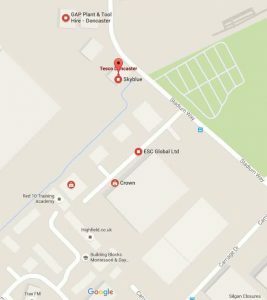 Palram are well known and respected all around the world for their incredible work with thermoplastic. 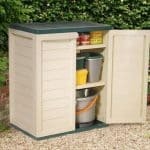 They have worked in many, many different fields, but here at WhatShed we really only care about their sheds, greenhouses and other garden storage solutions. Palram make high quality plastic based sheds and they have been in business for many years and are one of the most well know plastic shed brands in the world. Palram: What Kind Of Products Are In The Palram Range? 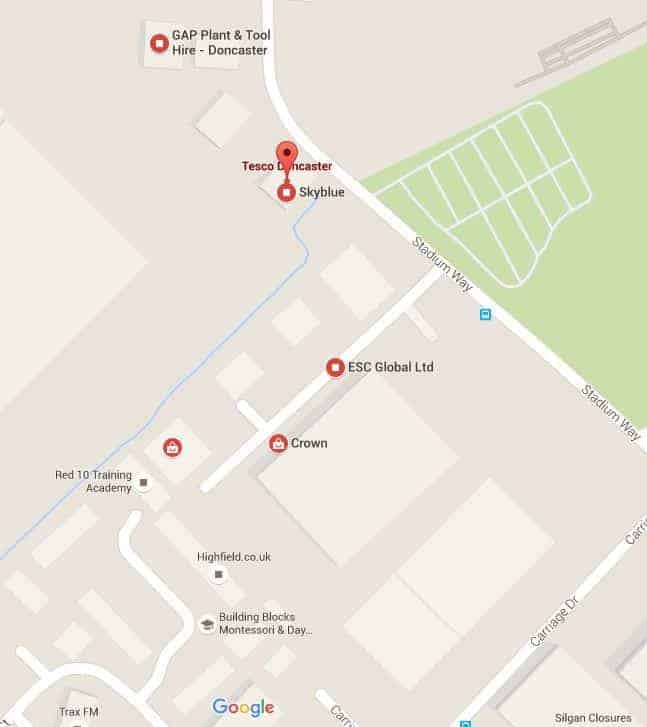 When it comes to sheds, Palram do not have quite as many as some of the other plastic shed retailers, but there is still a decent enough amount to give you a good choice. There are over ten sheds and they have a very cool look to them. Palram sheds have a somewhat workshop type look to them and one of the first things you will notice is that they do not have any windows. Now this is actually a smart design choice as the roof doubles up as a skylight so you still get plenty of natural light inside the shed, but you are also getting a high level of privacy as well. Palram seem to focus more on the small to mid sized sheds as they have plenty of sheds that are ideal for gardens that are not too large. They do have a couple of larger sheds, but their biggest is 6 X 12. 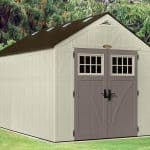 So as much as we love the design of Palram sheds, if it is a large shed you are after, then their largest may not be quite big enough for you. It is not just sheds that are part of the Palram brand. In addition to this they also have other products, most notably their line of products for those of you with green fingers. 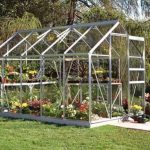 We are very impressed with the different greenhouses that Palram have as well as the products in their Urban Gardening range, which let those of you who do not have much garden space still grow your own vegetables and plants. They also make some smart looking coverings in the form of their gazebos, car ports and patio covers. We really like the design of their patio covers and really cannot think of another brand that has patio covers with such a classy design as these. Palram: How Is The Quality? The quality of Palram sheds is just spectacular. Palram were making products out of their high quality polycarbonate for years before they started making sheds. So they have used that experience to make a series of sheds that are very strong, so strong that Palram actually say they are next to unbreakable which is quite the bold claim indeed. But really these are some very well made sheds that are comprised with some very robust polycarbonate panels that are supported with a lightweight, but very strong aluminium framing. This combination really does make Palram sheds some of the strongest plastic sheds we have ever seen. The roof is very well made as they have given it a very nice slate look, but good looks are not the only good thing about a roof on a Palram shed. Their roofs are able to take a lot of weight, so if a lot of snow falls on it, no big deal. Also the roof serves as a skylight which in a way makes up for the lack of windows. As well as making sure the sheds are strong, the materials used will not fade, crack or be damaged in any other way by the sun or bad weather. 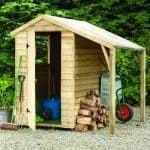 The materials used also make looking after the shed very easy as there is no annual maintenance required or any concerns over rot or other problems you may get with a shed made from timber. We feel that the fact Palram sheds are so easy to look after is a major reason as to why they are so popular. 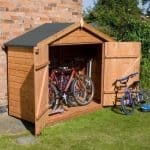 One thing we will say is that you may want to secure your Palram shed to the floor, or at the very least make sure you have some heavy items inside, as they are rather lightweight. Which is fine for when you are installing them as it makes it a little easier, but you would not want to leave a Palram shed empty when the wind is really bad. Palram: How Are The Products Priced? Here at WhatShed we are used to plastic based sheds costing more than their similar sized timber counterparts. But actually, Palram are some of the lower priced plastic sheds we have seen. For example, their smallest shed, the 4 X 6 Amber Skylight Shed, can be purchased for under £250 on a number of sites such as Shed Store and Amazon. This, for the quality, is a very decent price, even if the shed is a little on the small size. 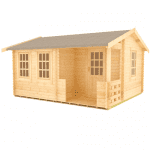 Most of the Palram sheds are available for under £500 – even the good mid sized ones, such as their 6 X 10 Amber Shed and their 6 X 8 Grey Skylight Shed. So while this is a little more than a wooden shed of a similar size may cost, we are still happy with the asking price that most sites are charging for Palram sheds. We already mentioned that there are not as many large Palram sheds as say Lifetime or Duramax offer. But Palram do have a couple of larger 6 X 12 sheds which are as large as they go. Now these we have seen at various prices all over the web, with the cheapest price being £589.99 for their 6 X 12 Amber Skylight Shed. In all fairness, for a shed of this size and quality, the price is actually not bad at all. Palram: How Customisable Are Palram Products? Customisation is not really something that you can do with a Palram shed. As they are made from Polycarbonate, you really have to take them as they are. Which is not something we really mind as they have a very cool and rather unique style that sets them apart from all the rest anyway. Palram offer their sheds in an amber or grey colour, so there is a bit of choice here. Some other plastic based shed brands offer official extras like work tables and shelving, but Palram do not do this which is a bit of a shame as we would have loved for them to have made some worktops that go with the style of their sheds. Palram really do make fantastic looking and strong (albeit a little bit on the light side) sheds. But the lightweight nature is not an issue when you fill it up with all kinds of amazing tools. The combination of polycarbonate panels and strong aluminium framing is great and something we really like. It makes Palram’s sheds not just strong, but also very long lasting and pretty much maintenance free. While they are not offering as large sheds as some of the other brands, for those of you in the market for a mid sized or smaller storage shed, Palram is certainly a brand that you should take a close look at.